First thing in the morning Dave and I went into Georgetown to try to get on to the internet, but the internet was down so that was a little frustrating. When we got back we headed to volleyball beach for registration for Regatta. We registered for the Coconut Harvest, the Scavenger Hunt and Annie signed up for the Sand Sculpture contest. In the end, we ended up staying at the beach all day. The kids from Mima and Side By Side were there, so Annie and Kristen played on the tree swing and in the fort with them. There was a lady making a straw basket and she showed me how to start one. It was slow work!! Dave went back to Georgetown this morning, and again there was no Internet. The girls and I stayed on the boat and got the schoolwork done. In the afternoon, there was a practice for the "Fish Net" skit that Sandpiper had made up in February and were going to perform at the "No Talent Show". It was a take off on the "Net" that happens every morning in Georgetown where everyone can listen on the VHF radio at 8:00 and hear the weather and all the activities that are planned for the day. There was room for lots of participants so Annie and Kristen were included. After that practice, Gotta Life took Annie and Kristen into to see the Pet Parade, and Dave and I went up to St. Francis Resort to see if we could get internet there. We were! We were able to check email and do banking, but Skype wasn’t allowed, so no phone calls home. After we were finished there we went back to the beach to see the No Talent Show. It was a great performance and the skits and performances were really funny! The "Fish Net" was really funny, as was a skit that Side By Side and Mima put together. It was a fun evening, but we decided to leave around 8:30 because people were getting tired. Today was Coconut Harvest so we headed to the beach around 8:30. We were on a team with Brian and Cheryl from Gotta Life. For Coconut Harvest, you have to take the motor off the dinghy, and power the dinghy with dive fins on your hands. There were 25 teams in all, and the objective was to collect as many of the 700 coconuts that were let go on the other side of the little bay. We were only able to get 25 L . Then we moved on to the land based part of the challenge. This started with "Guts and Butts" where you and you partner had to first take the coconut back and forth across the volley ball court with a coconut pressed between your bellies, and then you had to do it again with the coconut pressed between your backs. Both Dave and I, and Brian and Cheryl successfully made it back and forth both times to add 8 points to our team score! Then came the coconut toss where you had to lob the coconut over the volleyball net and into one of 3 rings. The largest ring was closest and worth 1 point, then there was a slightly smaller ring worth 2 points, and the smallest ring was worth 3 points. Dave and I, along with some other folks saw the opportunity to practice this one down at the other volleyball court so we did a couple of practice throws before we started. When our turn was up, Dave successfully got his 3 point throw and I got my 2 point throw. 5 more points for the team! When that was all done we headed back to the other side of the beach to get set up for the junior version of the coconut challenge. A few minutes later there was a big call out for the "Bird Life" team. So after a few confused moments we headed back to the volleyball courts – Dave was up at the Chat and Chill getting a drink for Kristen and couldn’t be found. Apparently we had tied for first place on the land based activities and there was to be a coconut throw off. Where was Dave??? As he couldn’t be found I found myself front and center competing in the throw off! The other team showed up first, so they threw first – fortunately for me, he tried for the 3pointer and missed, so all I had to do was get a single point to win. The pressure was on… I did it! Yeah!! It was all pretty funny! Anyway we the standard prize of a bottle of rum for our efforts. By that time Kristen was feeling really awful. She was getting a cold and trying to do everything and she finally gave up and I took her back to the boat and put her to bed. Dave and Annie stayed for the junior coconut harvest and Annie’s team won that so all and all we did pretty well. In the evening there was a beach party to share our winning bottle of rum amongst the other boats, but Kristen and I stayed home. Joined the grown ups and a couple of other kids joined the kids so both teams had 6 people. When we got the list we were overwhelmed with the list of "red" things we were required to collect – red high heeled shoes, red knee sock, the "Hunt for Red October" (book, not movie), red balloons. It was a very challenging list. We spent the afternoon making things red, and going around to other boats to see if they had the things we needed – of course every other team was doing the same thing. It became apparent pretty quickly that there were only a couple of copies of a Hunt for Red October in the harbour. It the end we accumulated 24 of the correct things. This put us in a tie for 3rd place with three other boats, but we had the slowest time so we didn’t win anything. The kids got 22 things, tying with the Gotta Life team, but again we were slow so they came second – winning Frisbees from Chat ‘n’ Chill. There we no scheduled activities that we were interested in with Regatta today. We did school in the morning. In the afternoon I helped Jennifer from Miakoda set up a scavenger hunt as part of a birthday party she was organizing for the twins. When we were in on the beach, Sunny from Slow Motion cut my hair – what a great cut! After the scavenger hunt was set up, I went back out to the boat and then Dave took the girls and I to shore for the birthday party. We went early so that we could go for a hike up to the Monument, but Sunny was still there and offered to cut the girls hair too. Kristen got a great trim and Annie got a lot cut off and a got it all layered – it looks really cute! (Hard to put in a ponytail now though). The birthday party was great and the scavenger hunt was a great success. It took the kids through a nature trail and across the island. There were around 20 clues, and it ended with a pirate’s treasure chest that was hidden in a cave on the beach. After the scavenger hunt we went back the west side of the island and they had lots of snacks and barbecued hotdogs. There was another "adult" party going on on the beach by then, so it was a busy place with lots of people and food. We stayed until sunset and then headed back to the boat. This was to be our last day in Georgetown. We started with school, and then I took the dinghy over to Georgetown by myself to get on the internet. It finally worked and I was able to catch up on email. It took longer than expected though and I was worried I would be late getting Annie to the beach for the Sand Sculpturing. In the end I got back around 1:00, and Marc from Side by Side was there wondering if we wanted to split the kids into a family team and then do an adult team too. I thought that would be fun and Dave was game, so we all went in to the beach. We also had Leanne and Chad from Cambyration and Angie’s Mom so we split the teams up and put the four kids and Leanne on one team, and the rest of us on the other team. A little while later Geneva from Gotta Life came the to the beach and she joined in with the kids. The sand sculpturing was really fun! We made a "Red Hot Knight" – in keeping with the Red Hot Night theme for the regatta. I thought he was really good! The strongest competition was a beach scene with three puppy playing in the sand. They were awesome. The kids built Eddie the Sea Serpent surrounding the island of Bermuda. It was great! When the results were in, the Puppies came first in the adult competition and we came second. The kids won the family class with Eddie. They all won gift certificates from Exuma Market in Georgetown, and as we were leaving the next day, Brian (Gotta Life) took all the kids to Georgetown to buy ice cream and candy at the market. We went over for a little visit to Side By Side when the kids were in town. We headed back to the boat as the sun was setting and stopped by Miakoda to say good bye to them too. We left Georgetown a little after 7:30, along with a big group of other boats including Gotta Life and Sandpiper. We weren’t sure exactly where we were going to end up at the end of the day, but it was a good weather window to leave Georgetown. The winds had finally died down and the weather was great. The wind was a little too far north for real sailing, but we were able to motor sail. We went about 35 miles up the sound and then went in through Galliant Cut around 1:30, when the tide was still ebbing, but had started to slacken. It wasn’t too bad a trip through the cut, and then we were in peaceful calm waters. It’s not that it was too bad on the sound today, but we were rolling around enough that weren’t spending any time below. When we got out on to the back, we put out the air tube and sailed along at around 3 knots, pulling the kids behind the boat on the tube. We did that for about half and hour and then decided we should move a little more quickly so we pulled them in an put the motor on so we could get to Black Point at a decent hour. 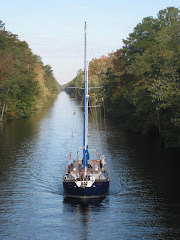 We were anchored around 4:00 after doing a 50 mile day – a lot farther than we had originally planned. Gotta Life and Sandpiper had stayed on the outside all day and come in a cut just north of Black Point and they were getting anchored at the same time as we were. The girls and I headed into town to put in a bread order and to get some water. Black Point is a great little town! Annie and I went into the village in the morning with her schoolwork, the garbage, the water jug and the laundry. We did two loads of laundry and got her schoolwork done. We picked up our bread from Lorraine’s Mom’s. We dropped off the garbage and got a jug of water. When we were done all that, we went back to the boat. The girls made a couple of trips back into town with Gotta Life to get water for them. Then we made a final trip in for another jug of water and bought some fish hooks and lures so we can try to catch a fish next time we go out into the Sound. We left Black Point around 2:00 to head about 10 miles north to Staniel Cay. When we got there we anchored on the south side of Big Majors to be a little nearer to the Grotto where we wanted to go snorkeling. The grotto is a big hole inside and underneath a little island. There are several entrances to it that have worn through the rock so you can swim through it from the east to the west side of the island. When you swim through the entrance, a big cavern opens up, and there is a hole in the top so there is light inside. The cavern is like a big room inside with a 20 foot rock ceiling and is a little bigger than a double garage. The water near the western entrance is teeming with fish and there is beautiful coral. There are a couple of smaller, underwater tunnels that lead in and out of the grotto, and it is really fun to swim down through the tunnel and back outside. There was a bit of current running through the grotto, and we were glad we were all strong swimmers and could get in and out without any difficulty. There were some people there that couldn’t get in against the current. We went back to the boat and moved it around the point of Big Majors and into a nice anchorage with about 30 other boats. Just after we got the anchor set we saw Gotta Life, Sandpiper and Priority coming in as well. After all the anchors were set we dinghied into "Piggy Beach" to see the pigs and goats. There was only one pig there to welcome us, but she waded out to great the dinghy. There we also a few goats around, but they pretty much stayed up in the woods. Apparently there are some baby pigs around, so we will have to try to come back in again when the babies are around. We did school this morning, and then we moved the boat up a little further in the anchorage to get a little more protection. We pulled up beside a beautiful schooner called Road to the Isles. After we dropped the anchor they called us on the radio as they had seen our Nova Scotia flag - they are from Mahone Bay! It was another warm and windy day, but it was overcast in the morning. After lunch the kids went for a swim around the boat. Later in the afternoon, Gotta Life came over and got the girls and took them into Staniel Cay in their dinghy, and we went over in our dinghy. It is a nice little town. It is tidy and the houses are painted in bright colors. There is a little general store, a yacht club and a little tourist shop selling t-shirts, hats etc. We were able to buy more lettuce J . After we went to town we went back to the grotto and went snorkeling there again. It really is a neat place to snorkel! After supper we went over to Priority with the folks from Gotta Life, Sandpiper and Zola. We had a quiet morning reading and tidying up the boat. Dave made conch horns out of the two conch shells that the girls found in Staniel yesterday. We took a trip into piggy beach and there were lots of pigs today (7 I think). They were kind of aggressive about eating our stale nacho chips, so that took some of the fun out of it, but they were pretty cool to watch. In the afternoon we went to the beach with the folks from Gotta Life, Priority, Zola. We took in the air tube and Brian from Gotta Life towed the kids around on the tube. Kristen had a great time learning to wake board behind Priority’s dinghy. I tried "sledding" behind Zola’s dinghy. A sled is made from a piece of plexiglas (about 1’x1.5’) hinged on a metal frame. The metal frame is attached to a rope towed behind the dinghy. You hold onto the sled and get pulled behind the dinghy, wearing a mask and snorkel. When you want to dive down, you tip the front of the sled down, and it takes you down under water. When you get to the bottom, you level off the sled and zoom along the bottom. When you want to go up, you tip the sled up and you back up to the surface. It is really fun! March 15 – Big Majors to Cambridge Key. Dave took a trip into Staniel Cay with Brian to get some water and dinghy gas, but they were out of gas! No big deal, we just wanted to top up our containers before heading back into the exuma land and sea park where there are no facilities. The kids made another trip to piggy beach with Gotta Life. We left around lunch time and had a lovely sail North towards Cambridge Cay. We arrived at Cambridge around 3:00 and picked up the last mooring! Gotta Life got the second to last one… We loaded up the two dinghies with snorkeling gear and headed down to the sea aquarium. Once again, it was beautiful snorkeling with lots of fish. I think we got a little spoiled by the coral at the grotto, because the coral at the sea aquarium was a little disappointing, but the abundance of colorful fish made up for it. When we finished at the sea aquarium, we dinghied over to the sunken plane. The current was almost slack, so it was a lot more fun swimming there than it was when we went a couple of weeks ago. We were able to snorkel down and look all around the plane. It is amazingly well preserved. We were invited over to Gotta Life to eat some of the Mahi Mahi fish that they had caught. It was terrific – even Annie who isn’t much of a fish eater was looking for seconds. Now we are motivated to try to catch one ourselves next time we are out in deep water! There was a shuttle launch this evening. Someone transmitted the count down over the VHF radio and that was kind of neat. We didn’t see too much of the shuttle, but about 5 minutes after take off, there was this strange cloud in the direction of NASA. It glowed white as if the moon was shining through it, but the moon doesn’t rise in that direction, and wasn’t up yet, so it must have had something to do with the shuttle but we aren’t really sure what it was. After we saw that we did see something heading up high into the heavens and we were pretty sure it was the shuttle. Not much was done in the way of school this morning as the girls wanted to make the most of their last morning in Cambridge. We took thank you notes over to Movin’ On and said good bye to them, and then we went swimming in a "blue hole" down near the south end of Cambridge. The blue hole is a deep spot right of the beach, and while there wasn’t the abundance of fish that we see near the coral it was pretty neat. We also saw a couple of rays swimming across the shallows. We left Cambridge at noon and headed up to Warderick Wells, arriving around 2:30. The girls did a bit of school when I went into the office to get registered. At 5:30 there was a St. Patrick’s Day get together on the beach. We had planned to take cookies in, but that didn’t work out too well and ended up taking nachos again. It was a good time and we got a chance to meet some new people. We had a nice chat with the folks off Road to the Isles and learned that he had been the skipper of the Bluenose II for 20 years! Hi all - no pictures with this post as we have only limited access to internet. Will update with pictures next time we have good internet. It was nice to spend a day without thinking about moving. We did school in the morning and in the afternoon we went for a walk on the Cay. First we walked be the blowholes that were really neat. They are holes in the rock that lead down to the water, and when the waves come in they force the air up the hole with great force and a big howling noise. After we left the blowholes we walked up to Boo Boo Hill. Lots of boats leave a carved piece of wood with their boat name on it on Boo Boo Hill, so there is a big pile of driftwood. It was fun to try to find boat name that we knew. We tried to find a nice piece of driftwood to carve to leave for Bird on a Wire, but the driftwood was pretty scarce. We’ll have to get one ready for our return trip. From Boo Boo Hill we carried on to Boo Boo beach and had a nice walk down the coast of the island that faces the sound, and then back across the island to the calmer, bank side of the island. On our way back to the boat we saw a couple of Eagle Rays swimming across the shallows in the middle of the mooring field. At supper time there was a man on the boat next to us who was throwing some wet garbage overboard and some big fish were eating it, so we tried too. There were a couple big fish that were under the boat and they would come darting out to get what we threw over. We didn’t want to spoil the fish too much with human food so we only did it a couple of times. No school today as it is Saturday! We packed up a lunch and loaded up the dinghy and took the dinghy around to a beach near Emerald Rock. From there, we hiked though another Loyalist Settlement and then across the island to the sound. We walked down along the cliffs and the beach of the sound down to the other end of the island to the Pirate’s Lair and the South Anchorage. It is a beautiful spot. Protected from the sound by Hog Cay, it has more of that beautiful turquoise water. We could see waves crashing over Hog Cay which was spectacular. There is a beautiful sandy beach and a picnic table where we had our lunch. We were visited by two curious little lizards who were happy to enhance their regular diet with some Pringles crumbs. Dave tried to take a close up picture of one of them and it jumped up a couple of inches to bite him on the finger. Fortunately it was only a little lizard and the bite didn’t hurt, but it was certainly startling! After lunch, we were able to catch the eye of the folks on Nicki May and they came to shore for a visit (the wind was howling far too loudly for us to hail them). We had a great chat on the beach as the tide was coming in, and then realized that maybe our dinghy wasn’t that safe way away on the other coast. We had a hurried hike back across the island, and fortunately our dinghy was safe. We had taken our snorkeling things with us, but we decided it was too windy and overcast so we went back to the boat instead. Snorkeling at the Sea Aquarium was amazing! There were so many fish and they would swim all around you. You could reach out and try to touch them, but they would swim away, always keeping about a foot away from us. There were lots of different types of fish, and coral. It was really great! We left there and went to another snorkeling spot where there was a little airplane that had crashed in about 25’ of water. It was amazing to see this little plane lying there under the water. There was a lot of current so if you swam really hard to the tail of the plane you could coast back down to the dinghy in about 30 seconds! Back to school today in the morning. I tried to make some white bread and it was a dismal failure – it wouldn’t rise at all. Very frustrating! We went over to visit Movin’ On, the mooring hosts and they suggested that we should move down a couple of moorings where we would get a little less motion, so we did that. In the afternoon we went for a hike across the Cay and up a high hill. Off the beach, there was a limestone tower that came up out of the water about 100’. The kids took their kites and had a good time flying them up on the hill. We hiked along the cliff down to the end of the Cay. It was a great walk. Calliope came over for supper so that was fun. They brought some brownies over and we were able to cook them in the oven. They were great! Today was a fairly quiet day with school in the morning and then a hike to the Conch Cay beach in the afternoon. Calliope and Movin’ On were going to go on a dinghy adventure to Compass Cay. We were invited along and Movin’ On offered to take the kids in their dinghy to take some of the weight off ours. Our first stop was Racheal’s Bubble Bath. This is a break in the cliff on the sound side and the waves crash through and then tumble down into a big pool that then leads out to the banks. Rachael’s Bubble Bath is most fun when there are lots of big waves, and that means high North East winds. In order to get there you have to cross Conch Cut. We took off with expectations of getting pretty wet in the dinghy and sure enough, buy the time we reached Compass Cay we were thoroughly soaked. Rachael’s Bubble Bath was really cool! It was like swimming in a pool of alka seltzer. The waves would come crashing through the break in the rocks and bubble all around you. It was really fun and we stayed about an hour. Then we headed further down Compass Cay to the marina. Compass Cay is a quiet spot that has to make it’s own water and generate it’s own power. There are a few little cottages and a larger lodge with a couple of rooms. They sell hot dogs and hamburgers for lunch and they were great! They have a school of fish and nurse sharks they stay off the wharf and Movin’ On brought their wet garbage so we could feed them. You are allowed to swim with the sharks when they aren’t being fed, but having spent enough time in the water already today, we stayed dry and reached over the edge and touched the sharks from the wharf. After lunch we took a garbage bag over to the sound side and collected a bag full of flotsam to help Tucker (the owner) keep his beach clean. Today was another quiet day with school in the morning and then snorkeling off the little island on the edge of the mooring field in the afternoon. This was another great snorkeling spot with lots of fish and coral to look at. We said "Good Bye" to Movin On and headed out of Cambridge Cay. Calliope also left, and offered to take our gas can into Sampson Cay to get it filled up for us as there is no fuel in Black Point. We had planned to stop at Big Majors to see the pigs that live on the beach, and go into the Thunder Ball Grotto that has been used in a number of movies, but it was too windy today, so we continued on to Black Point. Black Point is the second largest community in the Exumas with about 300 people. We got anchored off safely and I took the girls to shore to look around. People are really friendly. We were able to pick up some fresh produce, and ordered a couple of loaves of bread to be picked up tomorrow morning. We tried to get on the internet, but it took soooooo long to connected we pretty much gave up. We met Miakado (from Halloween) on shore as well as a few other boaters we had met along the way. People were going to get together around 4:00, so we went back to the boat to get Dave and went back to shore. We had a good visit with some folks, and then went back to Miakado for a little while. It was another late supper! Kristen and I went to shore to get the bread, but it took a long time as Lorraine’s Dad, had a little accident and it is Lorraine’s Mom that makes the bread. 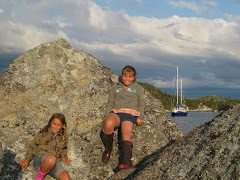 We had a great sail down banks but we knew we would have to go out into the sound to get down to Lee Stocking Island. It was a really, really, rough go through Cave Cut as we went out at the time when the tide was moving out into the sound at it’s fastest, and there were still a lot of waves coming off the sound. It was a pretty rough trip for the 8 miles we had to do off shore, and but then it was a fairly smooth trip in through Adderly Cut just north of Lee Stocking Island. We were anchored by around 3:00. We went for a swim and tidied up the boat. We took the kids dragging on the Air Head tube around the anchorage behind the dinghy. Calliope came over for a visit before supper. We left Lee Stocking bright and early to get to Georgetown. The wind was on the nose, as expected, but the seas were much calmer than yesterday. Calliope decided to stay at Lee Stocking until the forecasted front comes through so they can sail down to Georgetown instead of motoring. We arrived in Georgetown at 11:30. We didn’t really think we would be able to find Gotta Life in amongst the 300 boats here, but we saw them right away. We couldn’t raise them on the radio, but Sandpiper called us, and then Gotta Life saw us and came over in the dinghy. They were going to the beach to do a science experiment so they took the girls along. We got anchored off Monument Beach (on of three beaches on Stocking Island that people anchor off) The holding was great and it didn’t sound like the front was going to be too bad, so we decided to stay here instead of going to the more protected Red Shanks harbour on the western side of the harbour. Dave and I went over to visit Sandpiper, and then Gotta Life while the girls were at the beach. After supper we all went over to visit on Gotta Life. It was school again this morning, and I made some bread and some cookies. When school was over we took some bread and cookies to Sandpiper and then to Gotta Life. In the afternoon, some of us went hiking on Stocking Island. Dave decided to stay with the boat as the wind had shifted some and we were fairly close to Sandpiper. It was a great hike up to the monument, and then we went across the island to the beach on the Sound side. It is another beautiful white sand beach. Kristen and Erin dug a deep, deep hole in the sand. The rest of us walked down the beach. There were really neat limestone formations and caves. When we got back to the boat, Dave took his turn and went for a hike and got some great pictures. The Georgetown Regatta begins this week, and it kicks off with Children’s Day so today there was a meeting for Children’s Day so we spent most of the morning at the beach making plans for tomorrow. Children’s Day centers around the grade 3 and4’s from the Georgetown Primary school and organizing events for them for a couple hours, finishing up with them watching the boat parade. Dave went to Georgetown and got on the internet and got a few groceries. In the afternoon the kids went to Volleyball beach and Dave and I went back over to Georgetown to get some water. We got really wet coming back in the dinghy with all the water! It got pretty chilly so we closed up the boat and made Banquet Lasagna for supper, with Brownies for desert and then watch Captain Ron that we borrowed from Gotta Life. Children’s Day was a great success! We all went over to Regatta Point in Georgetown at 11:00 and started setting up the games. At 12:45 the Exuma kids were supposed to come over to start with the games. We were a little disappointed when only 9 of them were allowed to come! The grade 3 class had acted really badly yesterday and the principal decided that as punishment they would not be allowed to participate. There were also several grade 4’s that were missing – I wonder if they suffered the same fate. We split them all up into teams (we had planned for 8 teams so that meant 1 per team) and then added in the 20 cruiser kids. Each team also had a team lead, who was either an adult or a couple of the older cruiser kids, so by this time there were 3 or 4 on a team. Someone went back to the school to see if the principal had changed her mind while we got started with the introductions. A few minutes later there was another group of Exuma kids coming towards the park. Originally we thought the principal had relented, only to learn that she decided to send the grade 5’s instead! They were added into the teams so now each team had 5 or 6 participants, as well as the some of the older cruiser kids. We did two sets of stations, with 4 stations in each set, and two teams were at a station at a time. In the first set there was a water balloon toss, a relay race where the kids had to get dressed up in a big t-shirt, big boots and big foul-weather pants, a tennis ball on a spoon race and another relay where they had to fill up a bucket at one end of the course by running across the course with a cup of water on their head. In the second set, there was a station to make posters, a freeze dance, an obstacle course and a tug-of-war. Unfortunately we ran out of time and not all the kids got to do all the second set of stations. Then we took all the kids across the point to watch the boat parade. Each team had cheers, and waved their posters as the boats came by. There was additional excitement when the sailboats started to go aground right in front of the marshalling station! It’s also worth mentioning that it was blowing about 20knots of wind, again, and still (it has blown an average of 20 knots everyday since we have been in the Bahamas). A boat called Pirate entered their dingy in the parade and they had suckers and necklaces for the kids so they were trying to through this stuff from the dinghy up on to the wharf. Up until then we had all the kids sitting nicely on the wharf, and that certainly created some chaos!! At 2:45 we took the kids back to the park and everyone got a t-shirt left over from last year’s regatta and a ribbon. We spent some time tidying up the park, and then headed back across the harbour to Stocking Island and the St. Francis resort where there was a reception for the cruisers. We didn’t get back to the boat until 7:30 so it was another quickly put together supper – tonight’s choice was tuna casserole.